This is a genus of a few dozen species that are mostly native outside North America, and feed almost entirely on maples (genus Acer). A Periphyllus on an exotic maple in central Washington. It keys to P. lyropictus, but it certainly looks different from P. lyropictus online. Only one native species is commonly encountered where I collect, Periphyllus brevispinosus. When I was in graduate school in the 1990s, I thought taxonomy of Periphyllus in North America was easy. The papers by Richards and Essig & Abernathy made it seem so simple. Since then, confident identification to species often eludes me — some of my specimens simply don’t seem to fit the keys, and without voucher specimens I am left wondering. For example, the specimen to the right. Keys suggest it is P. lyropictus, yet photos online suggest otherwise. The distinctions among other introduced species also used to be more clear to me than they are now. This is one of our native Periphyllus, and I am reasonably confident in my identifications of it. My confidence comes from morphology, host plant, and geography that correspond to the original description. The only problem I see is that it is recorded from the leaves of Acer glabrum, and I always find it on the stems. 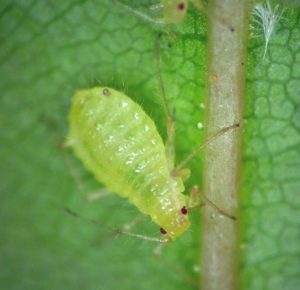 I find it attended by ants, often noticing the aphid colonies due to the flow of ants up and down the plant stems. Periphyllus brevispinosus fundatrix in the mountain foothills near Ola, Idaho. 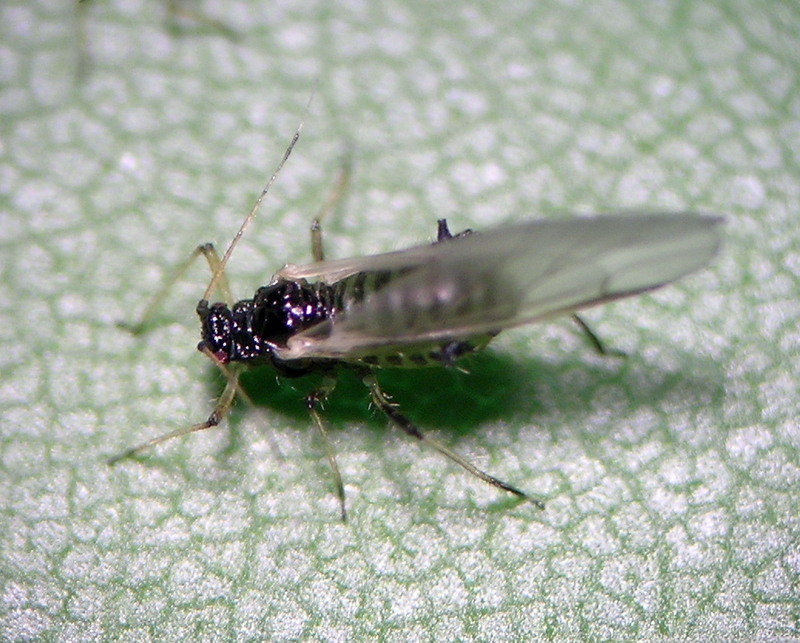 Here is another of the few Periphyllus native to North America. 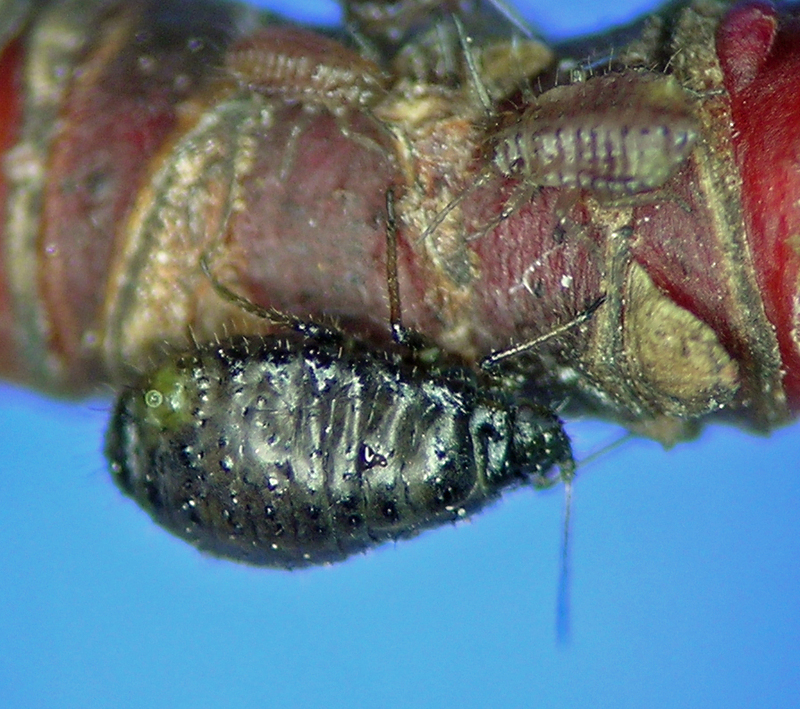 It feeds on a native maple known most places as boxelder, Acer negundo. Boxelder is not native in the Pacific Northwest states of the U.S., but often lingers for many years around abandoned homesteads, farms, and similar, even in the dry habitats of the inland Northwest. Periphyllus negundinis fundatrix on boxelder in the lot next door, near Lakeview, Oregon. Ah, an example of the frustrating species identifications of this genus. I think I am usually correct, but who knows. 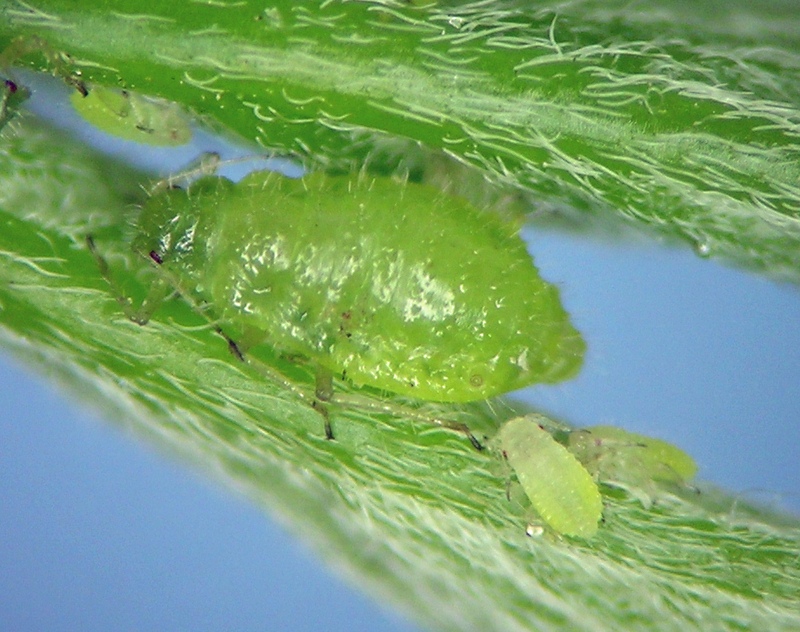 Anyhow, this aphid is one of the most common aphids found in cities and homesteads everywhere I have lived. 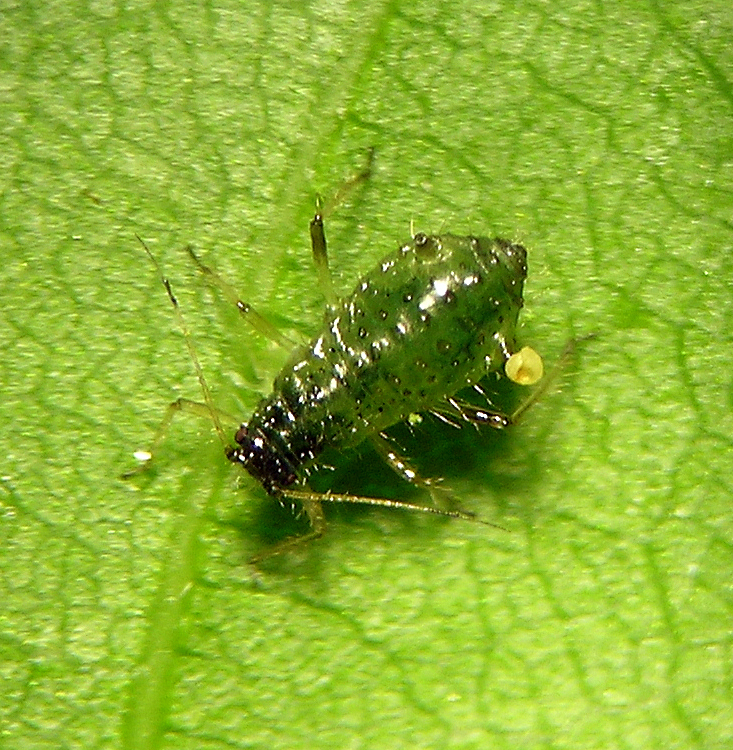 I have several photos of material I have identified as P. testudinaceus including the specialized summer form, the aestivating nymphs common in this genus, called dimorphs. 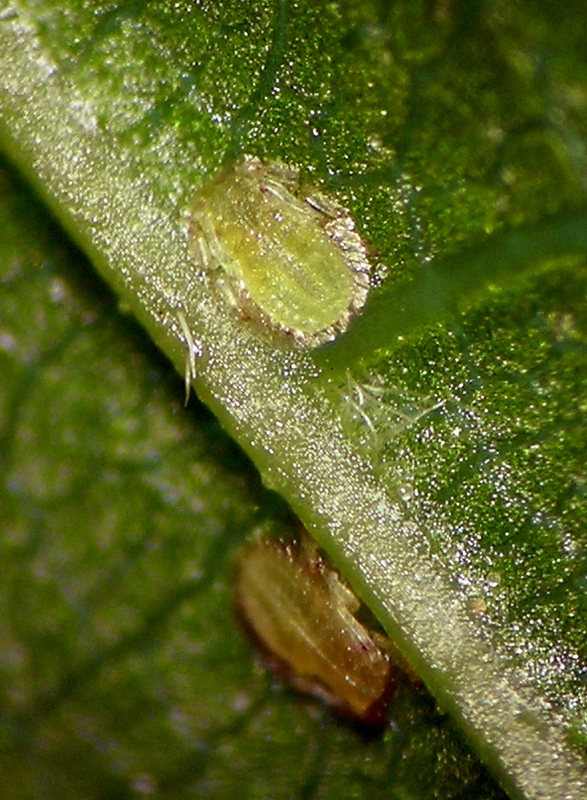 Periphyllus testudinaceus from Portland Oregon. Periphyllus testudinaceus dimorph from Portland Oregon.